UI Refinements – Makes the UI more intuitive and efficient to use. Transitions are improved throughout the OS and the launcher has been optimized for faster, smoother transition to and from the apps list. There are also adjustments in color, positioning, and test to make it easier to see, understand, and use. Connectivity for USB accessories – Adds support for a broad range of USB-connected peripherals and accessories. You can attach different input devices to improve the experience. For example, keyboards, mice, game controllers, and digital cameras. 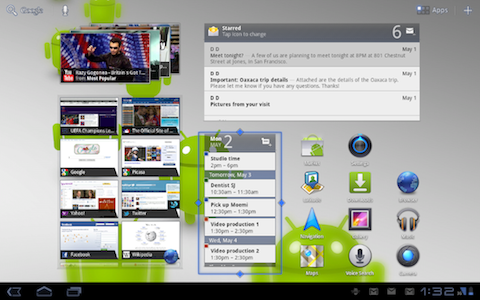 Resizable home screen widgets – Users can resize the home screen widgets using drag bards. They can make them bigger or smaller horizontally and/or vertically to include more content. Expanded recent apps list – This will help with improved multitasking. Essentially, it now allows you to scroll through the list of recent apps instead of just having the last few ones used. This update will start rolling out today to Motorola Xoom devices on the Verizon network.